惊济学? I love it. 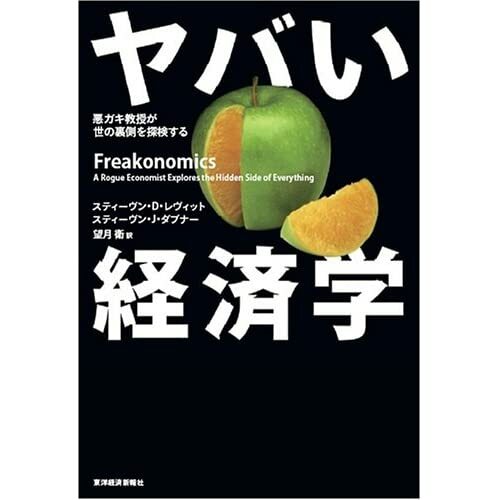 It definitely conveys what “freakonomics” is about better than “devil economics” does to me as a non-native speaker. Well, the wolf is dressed up as a sheep. If they translated the title as “Devil Economics” then I gather they are positioning the book as one that deals with economic’s hidden evils, i.e. economics as a (predatory) wolf disguised as a (gentle, harmless) sheep. Of course, this interpretation is entirely from my Western point of view. I have no idea if the sheep (lamb) – wolf symbolism exists in Chinese culture. But that’s not what the book is about at all. By the way, that’s a FOX not a wolf on the cover. Interesting. Though the piracy aspect is not a good thing, it is a good thing this book is getting out. It is the probing, critical, liberal arts education the Chinese never really get. The devil is a trickster, I like the real fake title! And the wolf in sheep clothing thing is Chinese as well as English…yeah the two together give an impression of something dangerous, but the contents are hardly a diatribe about the evils of economic analysis. Having read the book recently (a bootleg of the book, but in English), I was very dissappointed. I recall it as a very interestesting New York Times Magazine article, it was then padded with a bunch of BS and stuff that wasn’t even true – the idea that Superman scriptwriters took down the KKK, for instance. Oh, I did not mean to imply that this is what the book is ACTUALLY about. It’s not unusual that cover illustrations imply the book is about one thing and then it turns out to be about something completely different. Ditto for “translations” of book titles. While I cannot speak for the Chinese book market, I have seen this with Persian and Arabic translations of books (and of course the same goes for English translations of Arabic or Persian books). Not infrequently books get “appropriated” by other cultures and become embedded in rather different discourses. Even if the content remains largely the same, it is fed into a different “conversation”. Of course I am just speculating here. But since you were stumped, I thought I would throw it out there. I guess only way to confirm or discount this guess is to ask Chinese colleagues and friends. I’d be curious to hear their take on the cover and their readings of the book. Oh. It IS a fox! My fault for not wearing glasses and enlarging the picture when looking at this. Well the wolf – sheep thing would have been too neat. Money: Thanks for that explanation. A while back I was reading a transcript of a talk show from Taiwan where guests were discussing differences between the mainland and the island, and used the “Day after tomorrow” example. Only it wasn’t identified as the movie – so I, and lots of forum commenters, were under the impression that Taiwanese actually say 明天以后 instead of 后天 on a regular basis….seems so obvious, now. 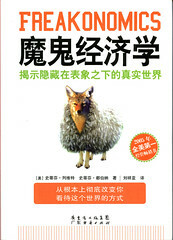 惊济学 is really fantastic name of the book.Actually, I think many translations in chinese is really successful. “gone with the wind” 飘。waterloo bridge 魂断蓝桥。Chinese is a coverall language.some times you will feel it beautiful. I agree Jeff. All I took away from the book was the premise that moralists study the way the world should work and economists study the way the world actually does work. It’s a much broader view of economics than I was used to. But the book itself was pretty worthless. Upon first reading your comment, I thought you had a good point and I agreed. After thinking about it some more, though, I think that 惊济学 would work. Why? Because when people said 惊济学 they would not say it the same way they would say 经济学–they would pause slightly before saying it, kind of like when we verbally add “quotation marks” to words in our speech. This slight pause would clue the listener in that something was up, causing him to either (a) realize the speaker was referring to 惊济学 if he knew of the book, or (b) realize that it wasn’t just a typical textbook on economics. I think there would be a little bit of the effect you describe, but not so much that it would be a problem, and it wouldn’t cause more of a problen than a misleading translation of the title. 惊济学? Economix? It’s too much of a crazy mix and match of meaning components for me… too much of a signosplice. I have a headache. I’m going now. I like your alternate translation, John. I think the title Mogui Jingji is a reference to “The Devil’s Dictionary” by Ambrose Bierce, which was popular in China a decade back and known as Mogui Zidian. So any title beginning with Mogui now suggests to the Chinese reader that the book will be light, amusing, irreverent and iconoclastic. 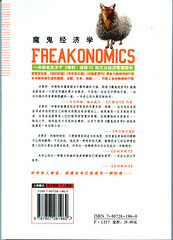 Perfect for Freakonomics. Thanks, that does make sense. Still, though, in the case of “The Devil’s Dictionary,” at least the word ‘devil’ was in the title! It’s best not to invent references if you don’t have to. Turns out that for the Taiwan/Hong Kong edition (not sure which), not only did the publishers preserve the “trademark apple/orange image,” but they used it for a title, too: 苹果橘子经济学.